Welcome to Down On The Street, where we admire old vehicles found on the streets of the Island That Rust Forgot: Alameda, California. Remember when a big ol' Detroit dinosaur was always a cheap-transportation option? 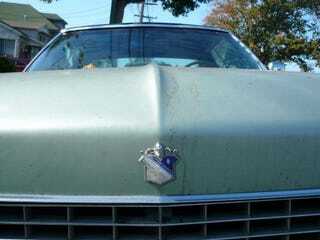 It wasn't long ago- maybe a decade- when Californians could take their pick of rough-but-solid full-sized Detroit iron from the Malaise Era; they sucked gas and were nightmarish to park in the city, but they were comfortable and easy to fix. Now you just don't see so many around, though this is our third Alameda Electra 225 (after this '69 and this clean '73. When you feel comfortable carrying your extra wheels in the back seat, you know you're driving a genuine survivor. The 455-cubic-inch (that's about 7.5 liters to you Yurpeans) engine in this thing made only 225 horsepower, but the torque was a driveshaft-bustin' 360 foot-pounds.